If I were a pregnant mom, I would be so excited to attend workshops that could help me prepare the coming of my baby especially if it was my first. And that is exactly how I was before. But even though it would be for my second pregnancy, I might be attending these all over again hoping to learn few more things, brush up my knowledge, listen to stories of other moms and meet new friends. Parents nowadays are so lucky to have easy access to various kinds of parenting workshops. And we must thank Manila Workshops and Medela Moms on this for passionately and continuously serving and catering to our needs. Presenting to you the third installment of Manila Workshops' First Time Parents (FTP) Series of workshops entitled Delivery and Newborn Care. 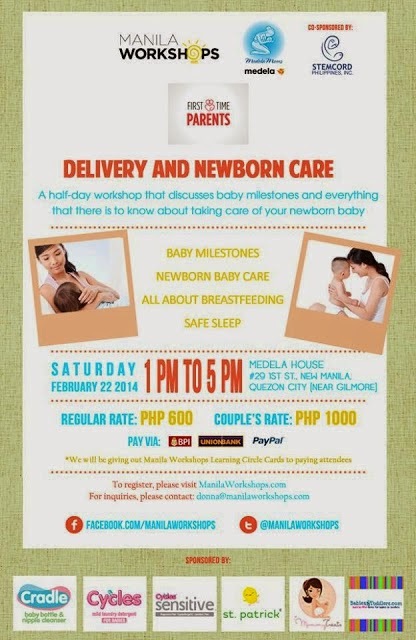 This event will take place on February 22, 2014 (Saturday) from 1pm to 5pm, to be held at Medela House. I highly encourage pregnant mommies that they be accompanied by their husbands especially on this topic about breastfeeding because they will be the one to support and back you up when the time comes that you badly need encouragement and moral support. Here, I'm giving away four couple seats (4 pairs) to this workshop. Just follow the Rafflecopter mechanics carefully. Giveaway will run for a week, from Feb. 13 until Feb. 19. Winners will be announced the next day and will be submitted to the event organizers. Good luck and feel free to invite your pregnant mommy friends especially those first timers. age of child : a week old. I want to give this opportunity to my bestfriend who is a teen mommy. I'd like her to know the things she should when having a baby :)... (doing this as a surprise for her .. I want to learn more about breastfeeding especially re-lactation. My husband and I are excited to attend the delivery and newborn workshop because as first time parents we wanted to give the best care for our soon-to-be son. I've been researching for expectant parents workshop and I'm happy I landed on this blog. In addition, the topics sounds informative and a big help for both of us. 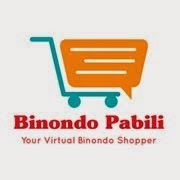 Thank you the Binondo Mommy for this blog.